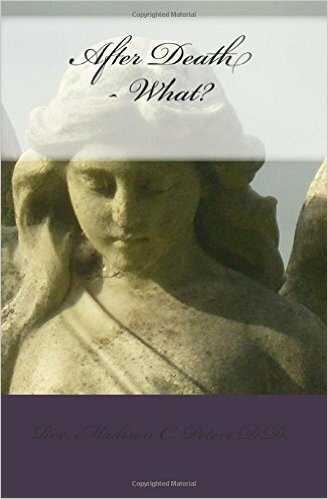 Christian Books Today: After Death - What? by Rev. Madison C. Peters D.D. The classic on the Bible's teachings on the afterlife, Rev. Madison Peters' easy writing style & passionate study has informed church teachings on the afterlife for generations. A book for the bereaved or for someone who wants to counter ridiculous ideas that some hold about "what comes after" we are taken from the riches of the Old Testament, confront the opinions of the secular world, and then get to know what happens between death and the Resurrection and see what the afterlife is really like. What will we do in Heaven? Will we know each other again? This brilliant book will leave you a detailed picture of what death holds and never again fear that final passing for the Christian Soul.